Good thing the heavy Victorian female “bathing outfit” of the late 19th century evolved. Thanks to lighter, tighter suits, women began taking up swimming—like young Gertrude Ederle. Born in 1906 to German immigrant parents, Trudy learned to swim at the Jersey shore. She dubbed herself a “water baby” and broke dozens of distance records. She medaled in the 1924 Paris Olympics. But her greatest achievement was yet to come. In the 1920s, crazy competitions of strength and endurance were all the rage, among them attempts to swim across the English Channel. Men had made the 21-mile trip, but no woman had—until August 1926, when 20-year-old Trudy left Dover, England smeared in grease and made it ashore in Cape Griz-Niz, France after 14 hours and 20 minutes in choppy, rough waters. On August 27th, when she arrived home from Europe, New York City went wild with celebration. 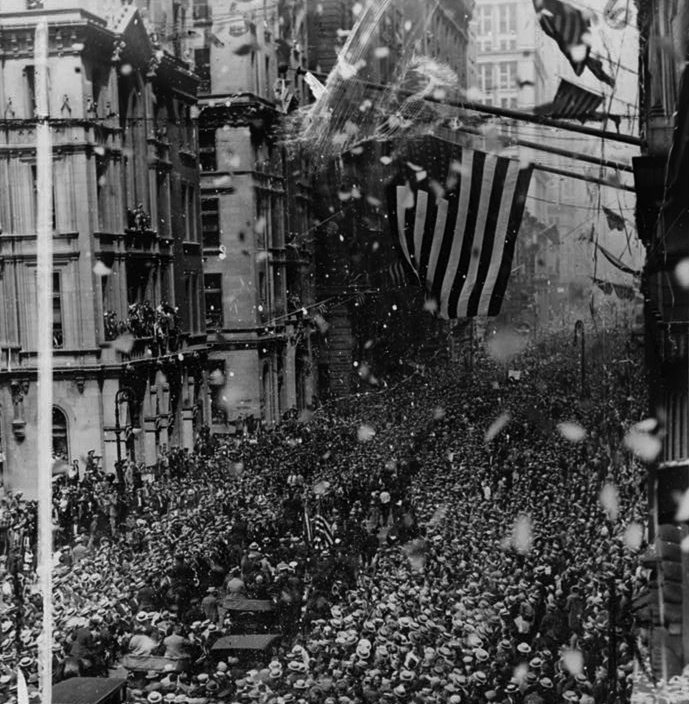 “Airplanes circled overhead as her ship steamed up the Narrows, the harbor swarmed with the biggest fleet of small craft ever seen, and cheering admirers packed Broadway as she rode to City Hall in a blizzard of ticker tape, confetti, and flowers,” wrote Peter Salwen in Upper West Side Story. Her father’s butcher shop at 108 Amsterdam was decorated with bunting. The next day 5,000 people turned out on West 65th Street for a block party in her honor (above). Trudy received offers from Hollywood and Broadway and was deluged by marriage proposals. But after the hoopla died down, she mostly returned to living a quiet, unassuming life. She moved to Queens and working as a swimming instructor for deaf children (her hearing was seriously damaged in the water of the Channel). 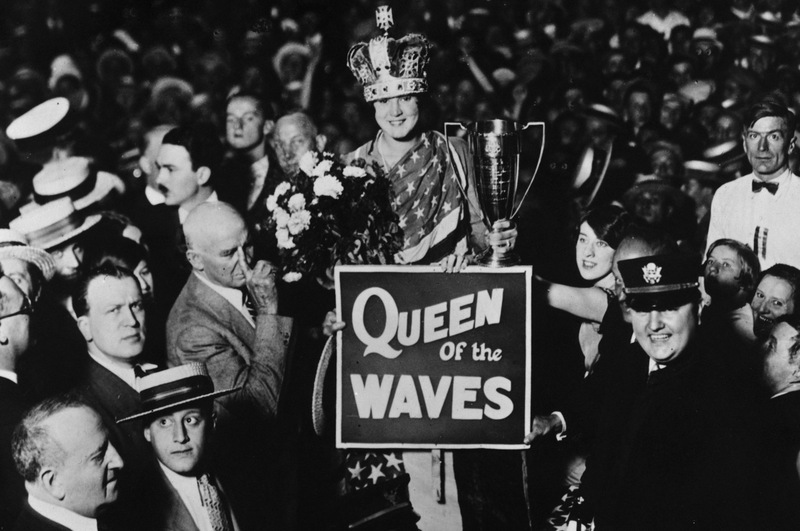 The swimmer dubbed “America’s Best Girl” by President Coolidge after her feat died in 2003 at age 98. 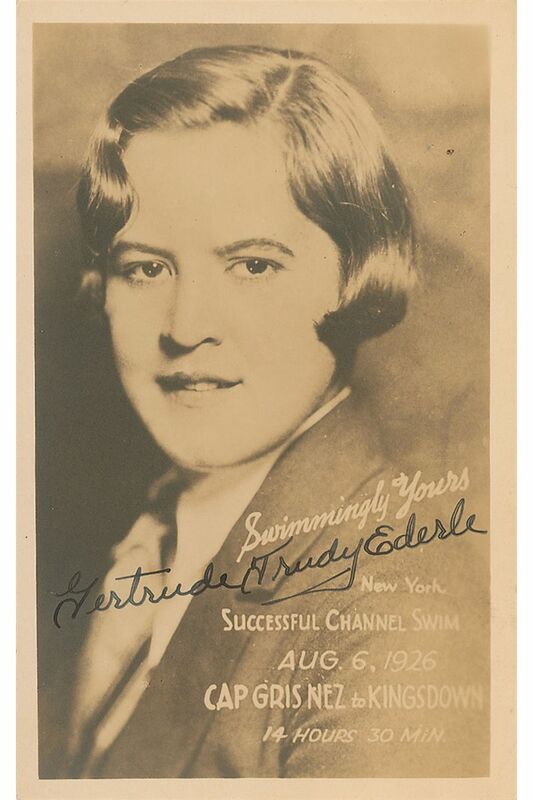 She hasn’t been totally lost to history; in 2013, the city opened the Gertrude Ederle Recreation Center, complete with a pool, in her old neighborhood on West 60th Street. This entry was posted on April 21, 2014 at 4:10 am and is filed under Sports, Upper West Side/Morningside Hts. You can follow any responses to this entry through the RSS 2.0 feed. You can leave a response, or trackback from your own site.